With offices across the globe, AXYZ prides itself in providing fast and efficient technical CNC support to customers from locally trained specialists. Technical CNC support is often a major concern with potential buyers, especially with respect to ongoing maintenance of CNC routers. Given how valuable time is, the quality of support should all be part of a buyers ‘due diligence’ prior to purchase, checking existing customer’s experience, vendor expertise, reliability and service records. At AXYZ, the support continues well after the initial installation or training has ended, and includes multiple methods to ensure downtime is kept to a minimum. Our technicians are trained in-house – All technicians go through a specialized training program. Proprietary to AXYZ, each step is documented through a course outline. Building the team for you – The global AXYZ Service Department is continually evolving to fulfill our customers’ needs. Time is of the essence – A specially designed service app is installed on all AXYZ technician’s mobile tablets, allowing for up-to-date customer information, real time communication and ability to follow up, second to none. AXYZ provides high quality LOCAL service, a feat made possible with highly trained personnel in local offices to meet the needs of customers across the globe. Choosing the right CNC support package – planning for tomorrow! Potential buyers are encouraged to visit the CNCshop – a one stop shop for all AXYZ machines. The emphasis is to provide information to help educate, inform and purchase tooling consumables and parts. This is where they’ll also find five great CNC support packages to choose from, as well as support for machines not purchased from the AXYZ product line. Along with providing the best customer experience possible, AXYZ is very focused on preventative maintenance. For further details and pricing information view our support packages. AXYZ is a leading global manufacturer of CNC router and knife cutting systems. 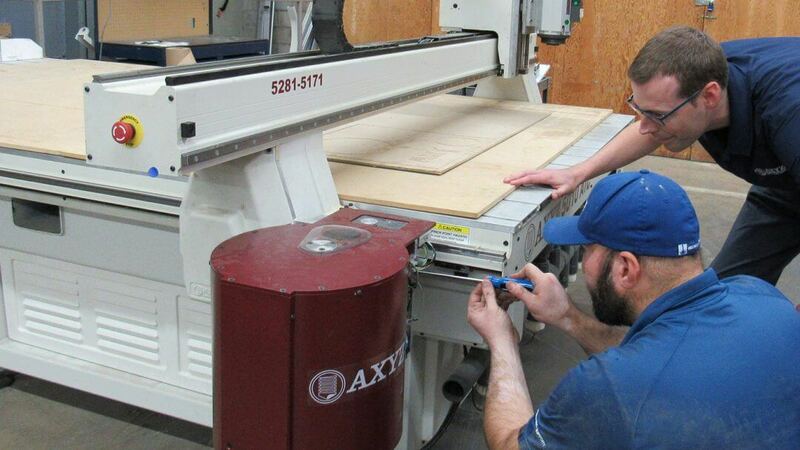 From a two-man beginning in 1990 to now, AXYZ has manufactured, sold, installed and supported over 10,500 CNC machines for use in a variety of applications.